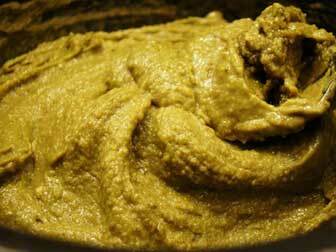 Raw pumpkin seeds are a particularly healthy and beneficial food to include in your diet for acne reduction and better looking skin. As well as improving your appearance, here’s how eating pumpkin seeds regularly can also help treat arthritis symptoms, prevent kidney stones, reduce LDL cholesterol levels and much more. 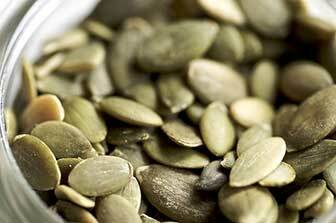 Pumpkin seeds are an excellent food for improving your skin tone and for treating acne problems. The primary nutritional elements in the seeds that benefit our skin include zinc, selenium, essential fatty acids and vitamin E.
There are several factors to consider when looking at where to buy pumpkin seeds. 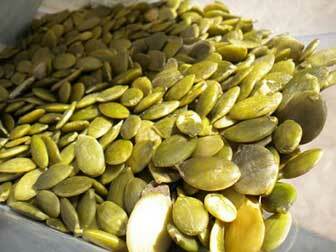 Raw pumpkin seeds contain the most nutrition but where and how they are grown is also important. 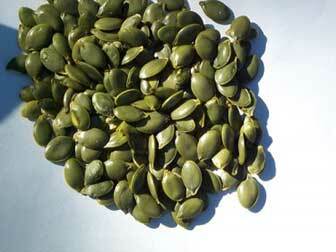 Whether you to find American grown organic pumpkin seeds, special extra large Styrian seeds, bulk raw pepitas, or even sprouted pumpkin seeds, this page has the best buying options I’ve found. 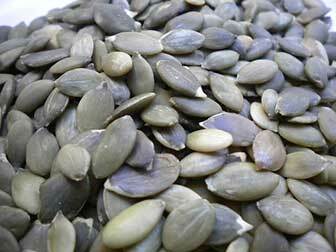 While the pumpkin seeds you can pull out of your pumpkins at home to eat have hulls, the ones you buy online will most likely be from hull-less varieties like Lady Godiva or the much prized Styrian pumpkins.